The big TV success story of last year was Heroes. Seemingly coming out of nowhere, it became a major success both critically and with the viewers, winning NBC big audience figures and making its forthcoming second season (which begins in the USA on Monday) one of the most eagerly-awaited shows of the new season. The BBC recently begun airing Heroes in the UK, where it has won even more plaudits and fans. With superhero movies generating big business at the box office and Smallville an established television success, it was only a matter of time before a specifically made-for-TV superhero series aired. Tim Kring's creation is a resounding triumph, successfully encapsulating the things that make superhero comics so much fun and mixing it with modern television and storytelling devices whilst at the same time learning from some of the mistakes made by other shows (most notably Lost, the troubled slow pacing of which is explicitly rejected by Heroes). 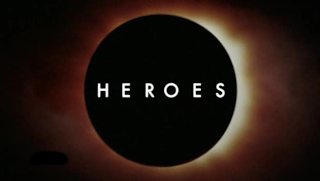 Whilst not flawless, the first season of Heroes is a highly enjoyable work. The series opens with Indian geneticist Mohinder Suresh hearing about his father's death in New York City whilst trying to track down people with 'special powers', whose existence he had postulated after looking into the results of the Human Genome Project. Mohinder is drawn to New York City and is soon following in his father's footsteps. But a shadowy organisation is also interested in Suresh's research, and a sinister man in horn-rimmed glasses named Bennett is on the trail of these 'special' people as well. Elsewhere, health care worker Peter Petrelli is divided between following his own ambitions and desires and supporting his brother Nathan's campaign to be elected to congress. At the same time Peter has started having vivid dreams that he can fly. In Tokyo an office worker named Hiro Nakamura believes he can freeze time and teleport, to his friend Ando's disbelief. In Las Vegas a young mother named Nikki is struggling to give her son a good education. In Los Angeles a cop named Parkman discovers he has a special skill and is drawn into the FBI's pursuit of a serial killer named 'Sylar'. In Odessa, Texas teenage cheerleader Clare has discovered her own power. As the series unfolds we are introduced to more and more 'heroes' and meet a radioactive man, a woman who can access the Internet with her brain, a boy who can tell computers to do anything, a man who can pass through walls and an artist whose pictures always come true...and his latest picture shows the obliteration of New York City in a nuclear firestorm. The first season of Heroes is an impressive piece of work. The regular cast is enormous, the secondary recurring cast even more so, but the writers fluidly move from character to character and plotline to plotline, keeping this huge rollercoaster moving. The series adroitly employs cliffhangers, with the first five episodes seeking to outdo one another for jaw-dropping finales. Be warned that you may sit down to watch one episode and end up watching five in a row. Most - but not all - of the plotlines culminate in the explosive season finale, but enough loose ends are left to hook the viewer into watching Season 2. Although one huge story, Season 1 is divided into four acts which loosely can be identified as 'Genesis' (episodes 1-5), 'Save the Cheerleader, Save the World' (5-9), 'The List' (10-18) and 'How to Stop an Exploding Man' (19-23). The problem with such a plot-heavy emphasis is that the series occasionally fails to delve into characters' motives very well, particularly with the secondary cast. Ted Sprague's motivations seemingly shift from episode to episode depending on what the writers want him to do. The series is also very heavily serialised, even more so than Lost or Battlestar Galactica. There are few respites from the ongoing storyline and it's often difficult to remember which events happened in which episodes. That said, the writers deliberatly insert 'special' episodes at regular intervals to break up this pace. The special episodes - 110: Six Months Ago, 117: Company Man and 120: Five Years Gone - are usually set in a different time period or focus solely on one situation rather than encompassing all the myriad plot strands simultaneously. The special episodes are also notably the best episodes of the series. Another problem is the lack of full-on fight sequences. Whilst there are several gun battles and an impressive sword training montage, there isn't much in the way of pyrotechnic combat between the heroes. This can be put down to either a lack of budget (something surely to be rectified in Season 2 following the first season's success) or perhaps a deliberate move to undercut the audience's expectations of what it expects from a superhero show. Either way, it is a minor factor. Slightly more irritating is that each episode starts with a recap of what happened before, sometimes in an original way (by showing the same events from a different character's POV, for example) but more often than not taking up valuable screen time. More bizarre is that sometimes the recaps feature different events and dialogue than the end of the preceding episode, like a 1960s episode of Doctor Who. It is a measure of how good this series is that these minor annoyances are the worst sins it commits. Heroes: Season 1 (****½) is a superb and impressive piece of work. With great acting from regular and recurring cast alike (expect to see a lot of Zachary Quinto and Masi Oka in coming years), excellent directing and a superbly planned and realised story arc, Heroes is now the hottest show around and it will be very interesting to see where it goes in Season 2. Heroes is currently available in the United States with the entire first season in one box set plus some impressive extras (including the uncut version of the pilot), both in standard DVD and in HD-DVD. A Heroes graphic novel, collecting the 34 online comics produced for Season 1 plus various artwork from the series itself, is also available. The UK version of the box set will be released on 10 December, although it's unclear if it will have the same special features. The box set is also being split in half with Part 1 released on 1 October, but the full box set is better value for money. I am loving Heroes. I'm in the UK, so I'm greatly looking forward to the revelations still to come! What a great show! I love it. Do you have Heroes on DVD yet? I've been avoiding the later seasons because I don't want to tarnish my currently beatific attitude towards Heroes. Thoughts?